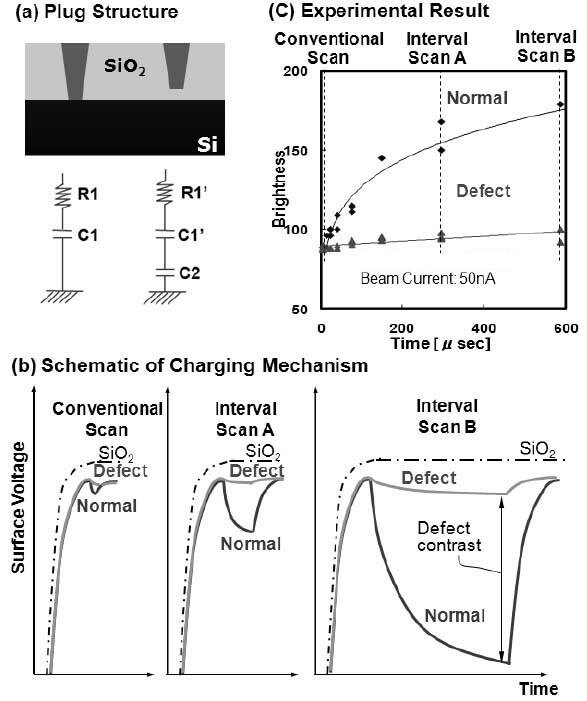 In many cases, the difference of voltage contrasts between non-defective (normal) and deflective locations in integrated circuits (ICs) is not significant because of the small deviation of impedance between them, for instance, when the defective plug is amorphous silicon (Si) instead of poly-Si in normal plugs. In these cases, e.g. the case in Figure 2853, interval scan of electron beam can be used to enhance the voltage contrast. Conventional scan employs electron scan without time interval between different scans. J. H. Oh, G. Kwon, D. Y. Mun, D. J. Kim, I. K. Han, H. W. Yoo, J. C. Jo, Y. Ominami, T. Ninomiya, and M. Nozoe, Interval Scan Inspection Technique for Contact Failure of Advanced DRAM Process using Electron Beam-Inspection System, Journal of Semiconductor Technology And Science, 12 (1) (2012) 34.